Four men also trafficked fellow Latvian nationals into the UK. Gangsters: Crown will try to retrieve criminal proceeds. 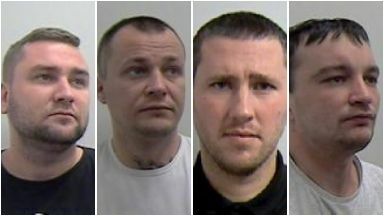 Four men have been jailed for a total of 19 years and eight months after being found guilty of 'highly sophisticated' organised crime offences. Arvids Civkors, 30, from Edinburgh, Maris Kursis, 30, from Falkirk, Hardijs Langsteins, 37, from Salford and Aivars Dzagarjans, 38, from Northumberland were all convicted of illegal activities enabling international money laundering and fraud. The Crown Office said criminal profits passed through bank accounts owned by the men between 2012 and 2016. These profits included money obtained by hacking and malware attacks. During the same period, the gang also trafficked fellow Latvian nationals into the UK. Upon arrival in the country, their victims were forced into work at various locations around the UK while the gang pocketed their earnings. Anyone who refused to cooperate faced threats and violent assaults, Edinburgh Sheriff Court heard. The four were found guilty last month of involvement in serious and organised crime. However, they were acquitted of trafficking offences. Returning to court for sentencing on Tuesday, each of the men was sentenced to four years and 11 months in jail. Passing sentence, sheriff Thomas Welsh said: "The offences were highly sophisticated and were executed with meticulous precision. "Given the impact that it had on the individuals named on the indictment and the banking system in general, I conclude that there is no alternative to custody in the case." The four men will now face actions under the proceeds of crime act, with this action scheduled to begin in January. Crown Office procurator fiscal for specialist casework, Jennifer Harrower, welcomed the sentencing. She said: "Money laundering is not a victimless crime and Hardijs Langsteins and his gang played an integral role in a complex, large scale operation which facilitated the criminal activity of others. "I hope that these convictions and the sentence, including the Serious Crime Prevention Orders granted for Langsteins and Kursis, send a strong message to others involved in this kind of criminal behaviour and demonstrates the ability of police and prosecutors to investigate, prepare and prosecute serious and organised crime of this nature. "The Crown will continue working with the police and other agencies to ensure that these crimes are detected and those responsible prosecuted using all measures at our disposal."